No. 1 Kentucky defeated No. 4 Louisville 58-50 on Saturday at the KFC YUM! Center. Louisville (11-1) battled through a defensive stalemate in the first half trailing at halftime 22-18. Kentucky (13-0) led 35-32 with just under nine minutes left in the second half before going on a 10-2 run to take control of the game. Louisville shot 15 of 58 from the field (25.9%) struggling to gain any consistency on the offensive end. Chris Jones had the only Cardinal assist. The Cardinal backcourt of Terry Rozier and Chris Jones combined to shoot 8 of 33 from the field and scored 28 points. Rozier added eight rebounds. 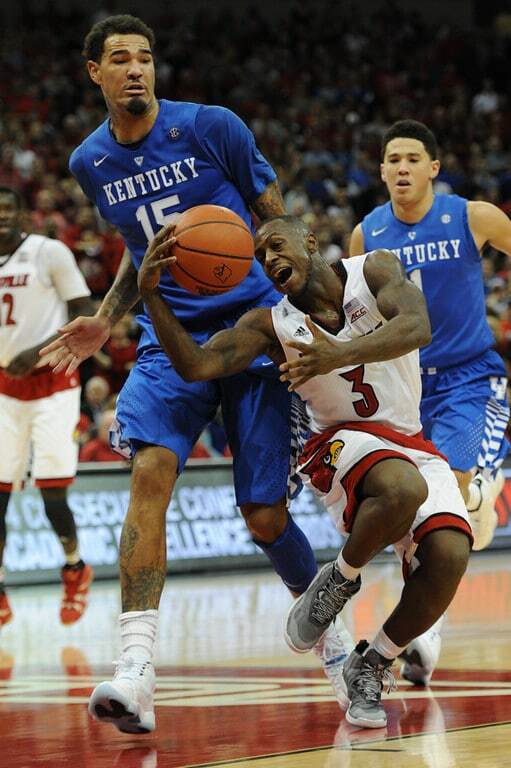 Kentucky denied forward Montrezl Harrell the ball throughout the game, slowing the junior forward to nine points and eight rebounds. Four of the five Cardinal starters played over 35 minutes. Harrell played the entire 40 minutes, Rozier and Jones 37 minutes while Wayne Blackshear played 35. Louisville will face Long Beach State on Tuesday December 30 at the KFC YUM! Center.